How does Mild Steel Benefit the Automotive Business? As the least expensive of all steels and the most widely used, mild steel is your go-to alloy whenever you have a project that's going to need hefty amounts of metal. This is why it's so commonly used by the automotive business for chassis and body panels in every road-worthy vehicle, from standard five-seaters to massive trucks. But what benefits does mild steel have over other metals and materials in the automotive business, and what potential can still be mined from its versatile nature? When you're looking for the right material to benefit your particular industry, you want something that has a profound cost-benefit that can also be improved for future industry use. Mild steel not only suits a car manufacturer's desire for low-weight vehicles (a must for getting cars as fuel efficient as possible), but it is also hugely affordable and can be engineered in a lot of different ways to meet both crash safety and performance requirements. The unique kind of flexibility seen in mild steel doesn't detract from its strength to deflect energy in the case of a collision either - and we don't think you need to be told how important impact resistance is in car manufacturing! One reason mild steel has been so heavily favoured by the automotive industry for so long is it exhibits something called 'ferromagnetism'. This is the basic mechanism by which certain materials can be formed into permanent magnets. At room temperature, the atoms in mild steel are arranged to form a structure that is predominantly ferrite (which is magnetic). Sharing good company with storage devices, transformers and fridge magnets, car parts are extensively made with mild steels precisely because of their attractive potential. Speaking of attraction, mild steel also dotes upon the modern demand for cars that have a stylish, memorable appearance. 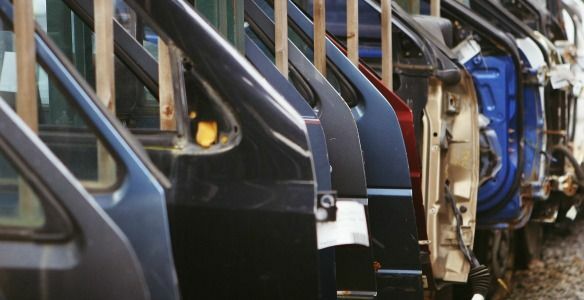 It is commonly used for the outer panels of cars and other areas abound in complex shapes, and though this exposure would normally arouse worries of corrosion and rust, this has been controlled in recent years by special steel coating technologies such as zinc electro coating, galvannealing and hop dipping the steel coils prior to their pressing. Wax injection and other sealing & painting processes also help to create a wear resistant skin whilst preserving its tough and ductile interior. As an industry that is trying to be as environmentally aware and malleable as possible, mild steel is a good way to go in terms of bringing about an energy-efficient production. Steel production uses a lot of energy, but still considerably less than most metals. Since it's usually magnetic and easy to sort from a batch of mixed waste, it is easily recycled and no matter how many times it's reused it won't loose any of its quality. There are several challengers to mild steel in the automotive industry, including our old friend aluminium, and other, previously unheard of varieties of metal. We're sure the time to move on from mild steel will come someday, but this doesn't detract from the astonishing impact and profound benefit this low carbon metal has brought to an industry that is arguably the foundation for our modern world.